Do you ingest essential oils? Whether you do or don't, you may have noticed… it's a controversial topic! However, it's still possible to know and understand the issue. Let's explore what certified aromatherapists have to say — their recommendations on what is safe and what isn't. It is wise to be cautious. Even inhalation of certain essential oils can be dangerous. For example, do not diffuse or use eucalyptus essential oil with children. Citrus oils (among others) should not be used in skincare products and then worn out into the sun. They are phototoxic and cause skin to be more sensitive to ultraviolet rays. Furthermore, many essential oils are harmful during pregnancy. And not all essential oils are made with equal care and quality. When in doubt, play it safe. Educate yourself on the essential oil you wish to use and what its contraindications are. 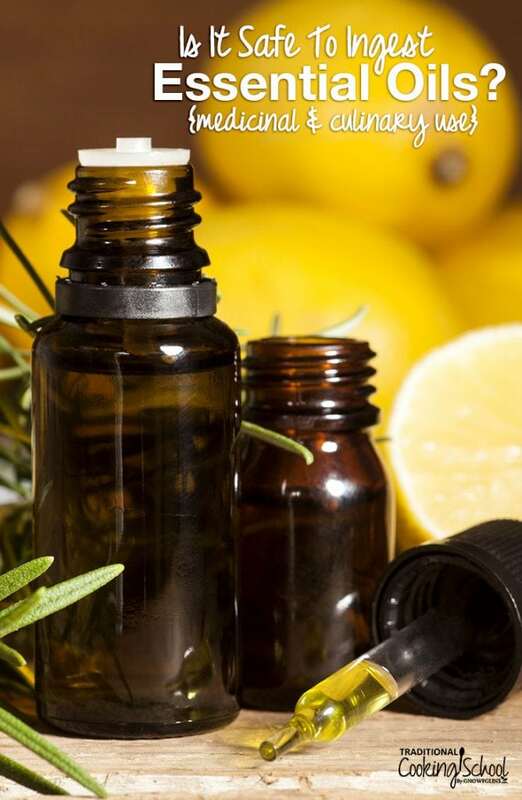 Choose a reputable essential oil company that uses both the common and the Latin name, gives the country of origin, chemotype (when applicable), and shares their farming practices and production methods. Traditional Cooking School recommends both Rocky Mountain Oils and Aroma Foundry as reputable sources of essential oils. The consumption of essential oils is controversial partly because of their concentrated and powerful effects. Furthermore, essential oil experts tend to err on the side of caution, advising against the internal use of essential oils. This is because the majority of lay people may not be educated enough to ingest them safely. So, is it safe for individuals not trained as aromatherapists to research and decide for themselves if essential oils are safe to consume and use? To consume essential oils safely, study and understand each essential oil individually. Oregano and clove essential oils, for example, should be taken only rarely and in the short term. They can be damaging to beneficial gut flora if taken over a long period of time. Additionally, peppermint essential oil has made great strides in treating IBS — yet can be irritating to the skin. These examples serve to illustrate the multi-faceted nature of essential oils. As a general rule, when using essential oils externally, always dilute with a carrier oil. These include vegetable oils like castor, coconut, olive, jojoba, or avocado. Never dilute with water — water and oil don't mix! Aromatherapists emphasize the importance of diluting essential oils to a range of 0.5 to 5%. Exact dilution depends on the patient, their age, health circumstances, and also the oil in question. In some instances, you may topically apply essential oils NEAT (without a carrier oil). I have done this with clove essential oil, for example, to remove moles and warts. This method can be very effective, yet does risk an allergic reaction. This is because essential oils are rich in aldehydes and phenols which can irritate the skin. Of these 2 options — using a carrier oil or blending an irritant oil with a non-irritant oil — the former may be preferable for the majority of lay people. It combines gentle healing with ease! The Internet is full of stories about essential oils causing injuries, often due to unsafe application. Were the essential oils consumed undiluted, or improperly diluted in water? Yes, this means that adding essential oils to a glass of drinking water is an improper, potentially unsafe application. There's no doubt that essential oils by themselves, or when improperly diluted, can harm gut flora and the mucosal lining of the digestive tract. However, if properly diluted, do they still pose a problem? If many essential oils are antimicrobial, antibacterial, and anti-fungal, might they kill beneficial bacteria as well as the bad — diluted or not? The truth is, not enough research has been done to say for sure how essential oils impact our gut microbiomes in the long-term. Still, many aromatherapists still prescribe the use of essential oils internally, and with good evidence, too. Well-respected essential oil expert Robert Tisserand considers it safe to ingest 1 to 2 drops of essential oils daily. He pictures a scenario where essential oils are used in moderation either for flavor in cooking, or medicinally in the short term (source). Similarly, I asked an acquaintance aromatherapist about the bulletproof steamers I make. These contain hot milk or coffee, lavender or peppermint essential oils, butter or coconut oil, and maple syrup (source). She said that this high-fat emulsion is the right idea. While she does not recommend the daily consumption of essential oils, she does consume essential oils occasionally in her home — and always diluted in fat. She also has clients who use essential oils internally, both daily and short term, depending on their health situation, the dilution, and the essential oil in question. As you can see, proper dilution and moderation seem to be the keys for safe ingestion of essential oils. Many agree on the safety of essential oils used medicinally. What about using essential oils as flavoring in food? Is it wise? Ultimately, this is a personal decision. It remains controversial. Keep in mind that food is medicine. Just as culinary herbs like thyme, oregano, and basil boost the immune system, essential oils are medicinal and nutritional powerhouses as well! I want my food to be healing. Essential oils are one way (of many) to achieve that. Both Dr. Josh Axe and Dr. Eric Zielinski promote essential oil ingestion* (source and source). They see the culinary and healing benefits that essential oils provide. For example, they might advocate for the use of 1 drop of cinnamon essential oil — one of the more controversial oils to consume, since it is a dermal irritant — in your cake batter, emphasizing the benefit over the potential for harm. Blended with a high-fat batter, this oil may indeed be safe. Yet, as this example illustrates, we must weigh each unique essential oil individually. What are its risks? What are its benefits? Does one outweigh the other? *To be clear, both Dr. Axe and Dr. Zielinski occasionally advocate for the ingestion of essential oils diluted in water, which I and others discourage. Personally, I don't consume essential oils daily. Yet I do enjoy them weekly, blended into a high fat base (whether steamer, soup, or batter). I know firsthand the benefits of essential oils — oregano for pathogen overgrowth, lavender and peppermint for culinary purposes (even occasionally basil and lemongrass). Learn the top 5 essential oils for cooking here! The bottom line? Essential oils are safe — when used properly. If you aren't going to call upon an aromatherapist to assist you, educate yourself. Always dilute! Do you ingest essential oils? Why or why not? Leave your answers in the comments below! Since we don’t know that much about the effects of ingesting essential oils, I prefer to breathe them in or apply topically. I believe they know where to go and what to do! You can often “taste” them within seconds of application so you know they’re in there, getting right to work. I don’t have any reason to take them internally when I know I’m getting the benefits in other ways. I am curious if you have seen studies on the ingestion of Oregano oil being harmful to gut flora? I have researched a bunch and have only ever found studies done in pigs showing that Oregano had no effect on lacto bacillus or bifido. I have found that it’s incredibly effective as an antibiotic replacement and have never seen any negative effect on myself or my children. That being said, we probably use it internally less than once per year with our kids. I use it more often, for recurrent mastitis from a tongue tied baby who didn’t effectively drain my breath and breastmilk oversupply. So I am not advocating for frequent use, but I do think it’s a great alternative to antibiotic when paired with traditional foods diet. Our family of 7 hasn’t used an antibiotic in 9 years. I consider that a feat! Haha…Well it should say drain my breasts, not breath. Interestingly, there is really very little evidence that oregano oil can be harmful to the body. Very few studies have been done. The compound thymol is usually the cause for concern, in terms of long-term use: does it damage good flora, does it damage stomach lining, does it compromise organ function etc? I think your route is a good one, to just use it very occasionally and for important purposes like avoiding antibiotics and healing infections. Sounds like a great approach. Hopefully more studies will be done in the future! 🙂 Many sites that mention its dangers do not link to studies. Thanks for your comments and questions! Great info! Love this article. I like the info provided by you. Thanks a lot for sharing. Megan, I would be interested in your opinion on the safety of the ingestion of one drop each of oregano, lemongrass and clove in a capsule with 10 drops of coconut oil, twice a week for three weeks on and one week off? My hope is to lower tumour markers. After diagnosis of triple negative breast cancer, I refused chemo and did radiation. I have started this combo of oils because my tumour markers were up in April and had come down in June, but one is still considered slightly abnormal. I don’t believe they can be as harmful as chemo drugs, which my oncologist says I should have done and will have to do if there is recurrence. Thank you for your opinion. Hi Michele, firstly, big hugs! I appreciate your health journey and the hard work you are doing to be well!! Re the EOs, I am not qualified to give an opinion. I haven’t researched cancer to the degree I’ve researched other health conditions, and I’m not a practitioner to advise you. I wish I could give you more, but I will pray for you now. I pray you find good research that’s helpful for you and great practitioners to help guide you. Much love!! Megan, thank you for your honest reply. I have had a number of people say that yes, it is okay, but they have a vested interest in promoting the use of oils in any way possible. I will continue to do my research.